Most cases of Dry Eye (low tear production) are managed medically by medications that are designed to increase tear production. However, in those cases where medical therapy is not effective, we may offer surgical options. 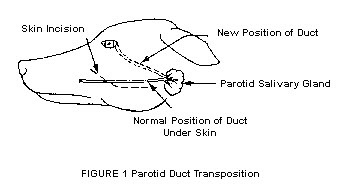 One of these options is a parotid duct transposition or PDT. This procedure re-routes the parotid salivary duct from the mouth to the eye, so that when offered a treat/food, saliva is emptied onto the eye. Although saliva is not exactly the same as tears, it provides lubrication to help protect the eye and reduce the longterm complications of dry eye. Another option is the use of tear-stimulating implants. This is a new surgical procedure where a small implant that constantly releases a tear stimulant is placed under the conjunctiva (the pink tissue around the eye). The implant is able to secrete the tear stimulant for up to 3-5 years. This procedure is used more often in cases where the pet is not tolerant of medications.